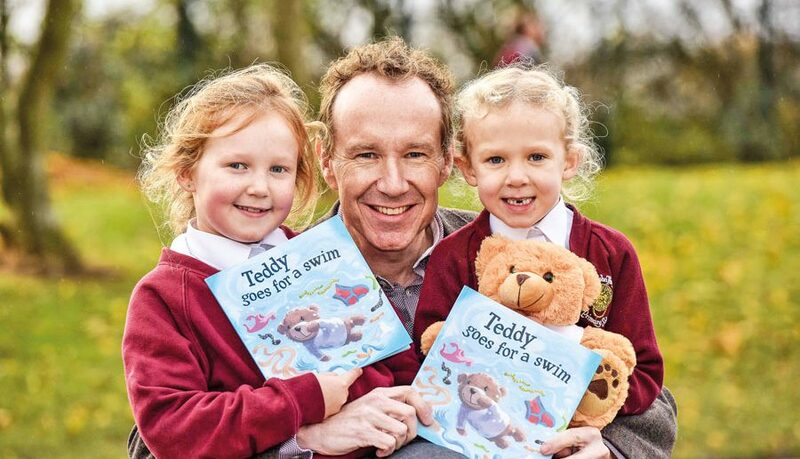 A Leeds dad whose daughters were upset when their teddies went into the wash has written a book to help other children who do not like being parted from their cuddly toys. Teddy Goes For A Swim tells the story of a boy and his favourite cuddly toy, Billy the Bear – it has been written by father-of-two, Adrian Johnson, and is illustrated by award-winning children’s author Steve Smallman. The book has been published by British home appliance brand Belling after research showed that seven in ten parents said their little ones had suffered tears and tantrums when it was time for their children’s favourite soft toy to be washed. The illustrated rhyming book is being given free to schools across the UK and is also available free on Apple iBooks. Adrian said: “Many parents struggle to get their children’s favourite teddy in the wash and it’s something myself and my wife have seen first-hand with our two, as well as with friends of ours. “We know parents who take out the teddy at night, put it through a quick wash and then tumble dry it before slipping it back with the sleeping toddler. Others have bought a second teddy double so there’s always a clean one on rotation. “We did some research on behalf of one of my agency’s clients, Belling, and it seems it’s a pretty common scenario, so we decided to create a fun tool to help parents and children alike and the rhyming book was born. “In the book, the boy and Billy have lots of fantastic imaginary adventures and sometimes get in a bit of a mess, meaning Billy needs to embark on his biggest adventure – a swim through underpants and sock-infested seas in the washing machine. Belling’s research showed that a fifth of parents said they would not dare to wash their child’s favourite toy, blanket or comfort item and one in five admitted to forking out for spare matching toys to ensure calm when it’s time for teddy to go in the wash. A further, sleep-deprived 65 per cent of parents said that they had resorted to waiting until their little ones were soundly asleep before putting toys in the wash.
Just over a third (36%) of respondents said they washed their child’s toys once a month but 11% said they had never washed them at all, this is despite a 2015 study showing 80 per cent of soft toys harbour bacteria that can trigger a bout of food poisoning.